The fall is officially here! As the temperatures begin to cool, new hairstyles are starting to appear. Just like those tan lines, summer hair trends are beginning to fade as we head towards the winter season. With all the tailgating and other events that happen during this time of year, in addition to changing out your wardrobe, you’ll want to get a fresh haircut to embrace the new season. Shorter hairstyles are the way to go for the fall season, and if are ready for your fall haircut, head to The Men’s Room Barber Shop in Milwaukee. Our barbers will be able to offer recommendations on the best styling for a desired cut and what hairstyle best compliments your face. 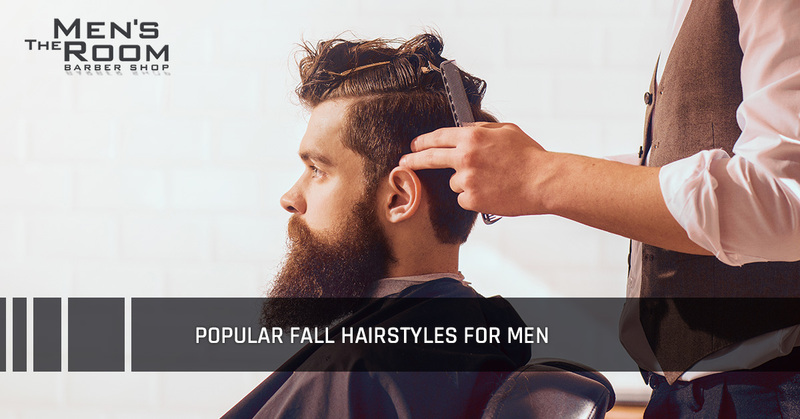 While your barber will be able to personalize your hair for you, we put together some popular hairstyles to consider this fall. Ah yes, the buzzcut — a tried-and-true hairstyle for just about any guy. This hairstyle is perfect for the fall because it requires low maintenance. Plus, once the temperatures cool down, you can hear beanies and hats without worrying about messing up your hair. Buzzcuts are a simple way to keep it basic, and are a great, hassle-free hairstyle ideal for the transition into the fall weather. If short hair isn’t your thing, grow it out a bit! The fall is a great time to discover new lengths and ways of styling your hair. Mid-length hair is great for taking on the brisk autumn weather. If you want to change things up for a more styled look, try keeping the hair on top longer, throwing it to the side with a hard part. If you have a busy schedule, save time with a more natural looking haircut. Combining both structural and organic forms, this style leaves curls on top and a drop fade on the sides. Styling is simple, a quick comb-through and maybe some product is really all that is needed. This natural-looking cut makes for an easy transition to a lighter look for the fall season. Lean into the crisper temperatures by embracing this windswept hairstyle. A textured short cut gives you more control by keeping hair shorter on the sides, but the hair on top can be a bit freer. Add a little product to achieve more hold up top, and you’ll be ready for all the fall festivities. If you want a more modern, yet classic hairstyle, this is the style for you. The undercut fade itself is one of the most tried and the most popular hairstyle when it comes to men and adding slicked back hair on top takes the look to a whole new level. The hair on top is relatively longer and slicked backed or pulled back to give it a neat and sleek look. Use men’s hair products like gel or mousse to achieve the slicked back fade. If you are due for a men’s haircut, make an appointment at The Men’s Room Barber Shop! We have the experienced barbers and popular hair products to help you achieve the right haircut for this fall!